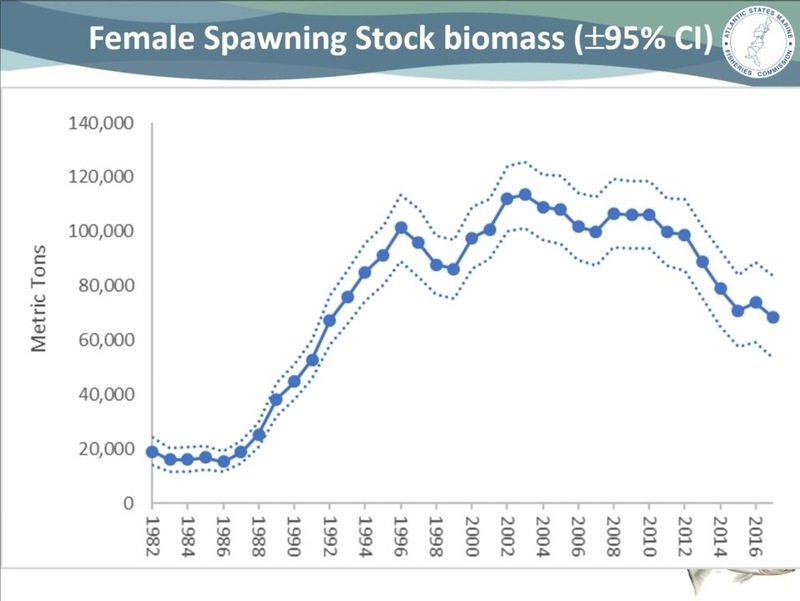 I'll just show a few screenshots here of the Draft Stock Assessment, Quick Summary is the Female Spawning Stock Biomass is continuing to drop. I'd be interested to hear the science or assumptions behind the recreational release mortality numbers, i.e. how they were determined. MRIP release data times 5% assumed mortality rate. The Striped Bass Management Board (Board) met to review preliminary findings from the 2018 Benchmark Stock Assessment. 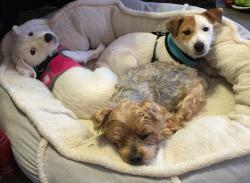 Unfortunately, due to the partial lapse in federal appropriations, the final assessment and peer-review panel reports were not available for this meeting. Board review of those reports will occur in May 2019 at the Commission’s Spring Meeting. For this assessment, the statistical-catch-at-age (SCA) model currently used for management was extensively modified to allow the modeling of two biologically distinct stocks. However, based on conversations that occurred at the 66th Stock Assessment Workshop in November 2018, it is anticipated that the Stock Assessment Review Committee will not endorse the use of the two-stock model to serve as a basis for fishery management advice, and instead will recommend that the single- stock SCA model be used for management. Accordingly, the Board reviewed results of the single-stock SCA model which indicated that the stock was overfished and experiencing overfishing in 2017, the terminal year of the assessment. These results are not expected to change with the release of the final assessment and peer-review reports. Please refer to the meeting materials athttp://www.asmfc.org/home/2019-winter-meeting for more information regarding data usage, model configuration and diagnostics, model results, model projections, etc. Following review, the Board discussed the need for adaptive management to end overfishing and increase female spawning stock biomass. The Board decided to wait to take management action (i.e., initiate the development of a plan amendment or addendum) until it can formally review and approve the final assessment and peer review panel reports for management use. In the interim, the Board requested additional information from the Technical Committee (TC) to better understand the extent of necessary action. Specifically, the TC was tasked with estimating levels of removals needed to reduce fishing mortality (F) to the F threshold and the F target, and to also provide an example recreational bag and size limit combination that would achieve those conditions on the coast and in the Chesapeake Bay. The TC will report back to the Board in May. the Board was unable to provide comment at this time. However, based on the preliminary assessment results, the Board decided to draft a letter to NOAA Fisheries opposing opening the transit zone and will review the letter at its next meeting following review of the final assessment reports. The Board will consider forwarding the letter to NOAA Fisheries at that time. 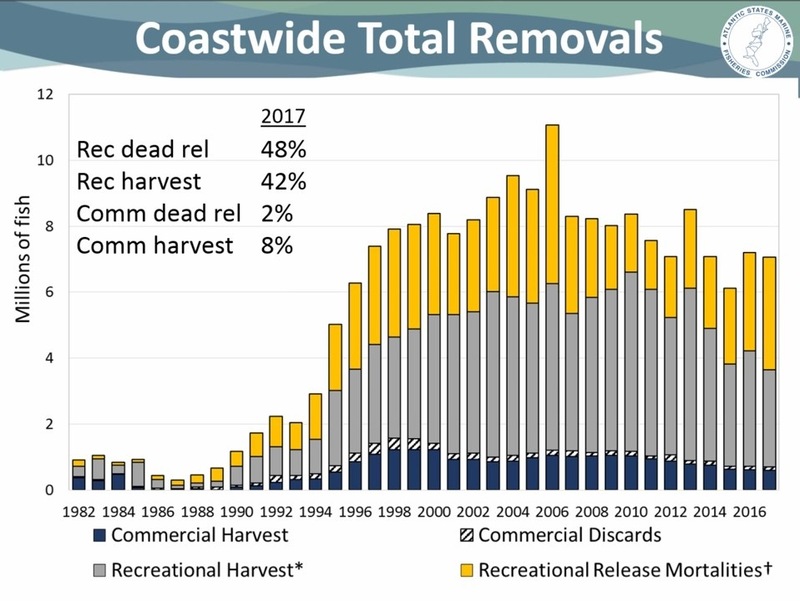 The Board also reviewed Maryland’s Conservation Equivalency (CE) Effectiveness Report on 2018 recreational measures for the Chesapeake Bay summer and fall fishery. Approved by the Board in February 2018, the primary objective of the CE measures are to reduce the number of dead discards in the fishery while maintaining the same level of overall removals. Using several outreach and education platforms, as well as collecting information from law enforcement and angler intercept data, Maryland concluded that implementation of the new regulations was successful; overall compliance with the regulations was high and overall removals were within the range of that calculated in the original CE proposal. Lastly, the Board approved changes to Virginia’s striped bass spawning stock survey and tagging program. Specifically, the spawning stock pound net survey was eliminated and is now conducted via multi-panel anchor gill nets, and tagging is conducted through electrofishing. Move to task the TC with providing the Board with a report that shows the reductions in harvest needed to reduce F to F threshold (0.24) and F target (0.197) and also providing one example of recreational bag and size limit combination (if necessary, seasonal restrictions) needed to achieve these conditions a) on the coast and b) in the Chesapeake Bay and report back to the Board in May.Motion made by Mr. Grout and seconded by Dr. Davis. Motion carries (15 in favor, 1 opposed). Move to have staff compose a letter to NOAA Fisheries opposing opening the Federal Block Island Sound Transit Zone for Board review in May. Motion made by Mr. Keliher and seconded by Mr. Kane. Motion carries (15 in favor, 1 abstention). 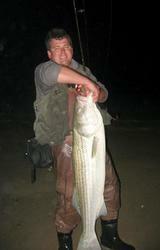 Move to approve changes to Virginia’s Striped Bass Monitoring Program. Motion made by Mr. O’Reilly and seconded by Mr. Clark. Motion carries unanimously. No way, my initial reaction that recs kill 9x the amount comms do and kill more by throwing back shorts than they do by keeping..... However, is my math correct on the release data. I release 500 fish - 5% or 25 fish won't survive. That is believable. 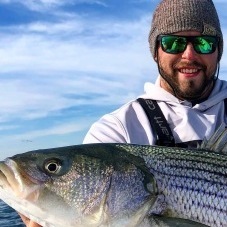 The commercial fishery should be the first fishery to go since by percentage commercial guys are more likely to kill a striped bass then a rec. Of course reduce recreational take while we are at. Get rid of that old dumb dumb way of management that talks about cycles and points at recs as the problem. I don't care how old you are or how long your family killed bass for money you need to cut that **** out. I dont know how the mrip release data is determined, but a 48% rec release mortality as a % of total removals seems overdone. But i base that purely on anecdotal evidence, i.e. what my eyes tell me. that can also be deceiving. The age-old problem is the "science" behind all these numbers is shaky at best and yet we're relying on it to make fisheries mgmt decisions. But thats beating a dead horse. At least the people in charge seem to acknowledge a declining female ssb. Ill look forward to seeing how they plan to address this. unlike some, im not anti comm fishery but i think both recs and comms will need to be prepared to make sacrifices if needed. The good of the fishery is for all of us, not just one user group. My opinion anyway. A lot of the release mortality is likely from the bay fishery. They target small fish, generally chum/use bait, high heat summer trips, etc. A six pack charter down there can do a ton of damage. For NE fishing, we've all had days where we catch 50-100 shorts. 8% of them die. That adds up.